Tantalum, what’s that, I hear you say. Well, allow me to explain. Tantalum is a highly corrosion-resistant bluish-grey metal with an extreme hardness and high boiling point. 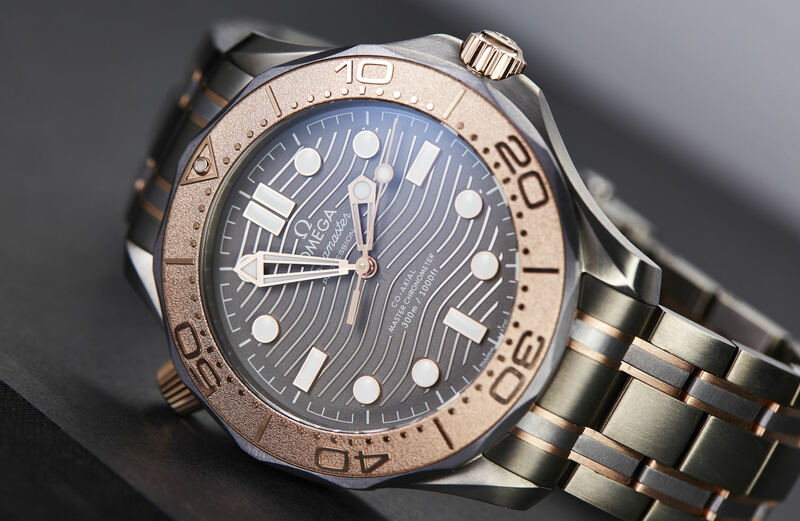 Which are the exact qualities you want in a dive watch, but also qualities that make Tantalum incredibly difficult to work with – and the reason why the material is not often seen in the watch industry. 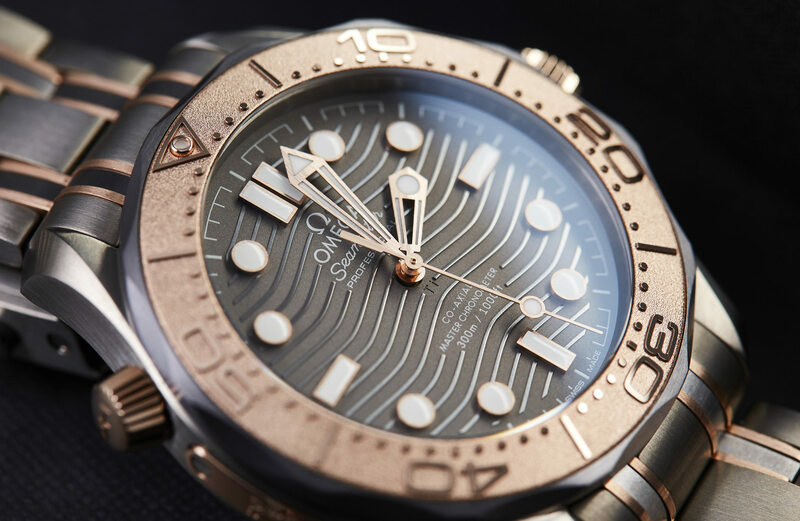 However, when Omega first released the Seamaster Diver 300M in 1993, their flagship model was a tri-coloured chronograph (ref 2296.80) that included a case made from titanium, tantalum, and rose gold. Twenty-five years later, the combination is back, only now it’s without the chronograph, and it features a host of modern updates. At quick glance, the limited edition looks quite similar to its regular collection siblings. But there’s a lot more going on here than first meets the eye. 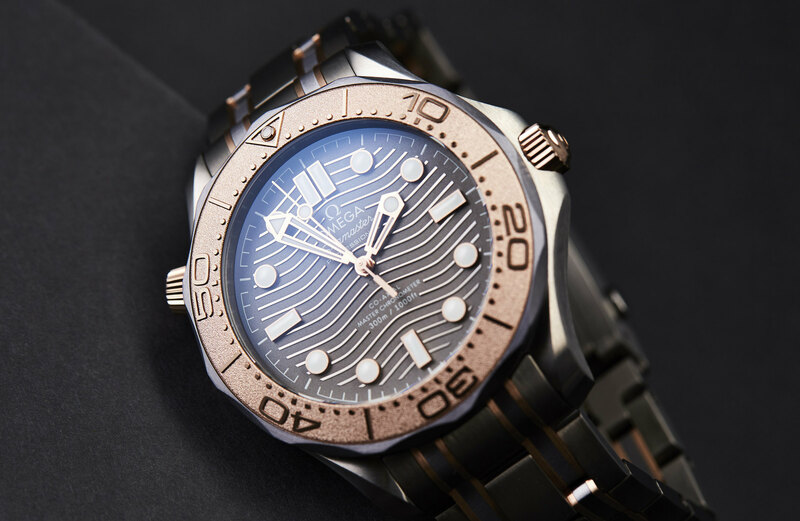 First of all, and most obviously, the bezel insert is 18k Sedna gold, with a frosted finish that tones things down and sets the stage for the muted grey titanium dial – with its laser-engraved wave pattern raised rather than etched into its darkened surface. There’s also no date, but there is a set of familiar 18k Sedna gold skeletonised sword hands and applied indices, and a case that measures 42mm. And that’s where the biggest point of difference begins. Using titanium as its base, surrounding the bezel, and in between the bracelet’s duelling twin lines of Sedna gold, is that lustrous metal I explained at the beginning: Tantalum. 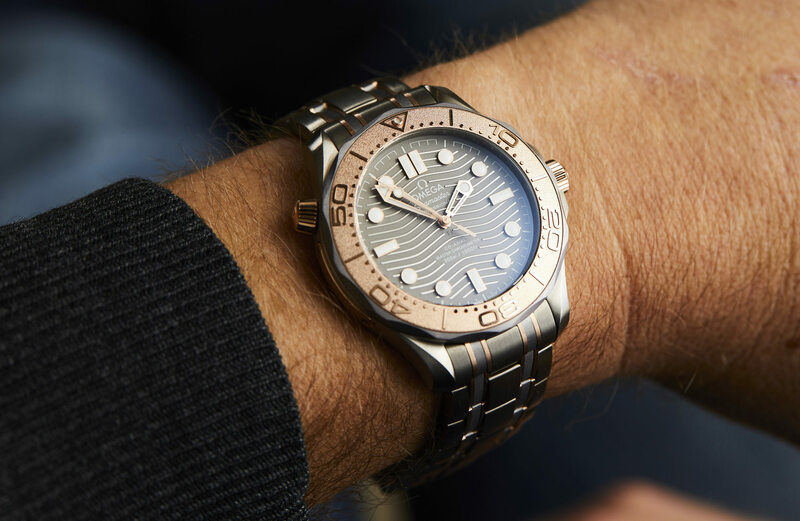 Tantalum’s appearance is slightly darker than titanium, and on the bracelet it’s been brushed horizontally instead of vertically – as it is on the titanium and gold links – creating a stark difference that adds a compelling look on and off the wrist. 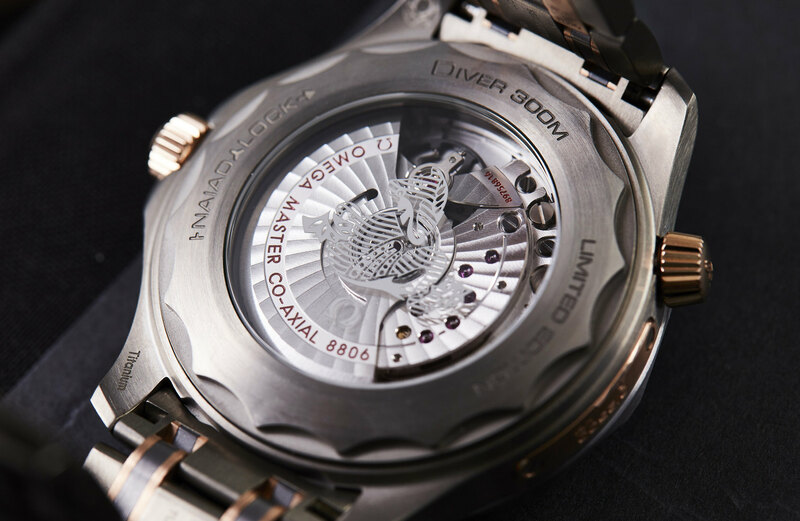 Inside is Omega’s Master Co-Axial 8806 movement. An insanely impressive mass-produced calibre with a 55-hour power reserve that not only uses the famed co-axial escapement but is also METAS certified for better than chronometer accuracy and a guaranteed magnetic resistance of 15,000 Gauss. Especially impressive when you consider that Omega were able to accomplish such a high resistance by only using antimagnetic materials in the movement – like a silicon hairspring – and foregoing the need for a soft iron cage. Meaning that the calibre can be put on full display and only slightly obscured by the famous Hippocampus logo, which thanks to a bayonet-style caseback lock, always sits in perfect alignment. Equally as modern on the outside as it is on the inside, this isn’t your typical mixed-metal watch. Making for one tantalising take on tri-tone.